Traditional Baby Nursery Decorating Ideas and Pictures to Show You How to Create a Traditional Nursery Style in Your Baby Room. A traditional baby room is the type that most of us had as babies when life was simpler and choice less abundant. We didn't have all the fancy gadgets, wall decals were a thing of the future and crib bedding was, well - pink or blue! Many moms are moving away from this style in search of something new and fun. 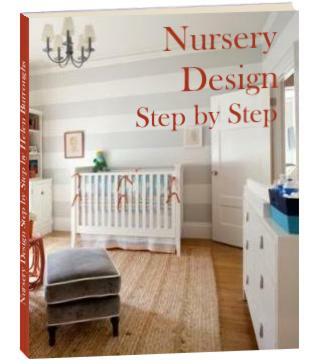 Stripes, bright colors and funky nursery designs are popular. However, the traditional nursery decorating style still has the advantage of being soft and welcoming for your little one. Besides some moms just can't resist pink! Recently there has been a return to a more elegant form of this nursery style. Lilac and sage damask and paisley crib bedding prints are refined and sophisticated for the contemporary parent while still retaining the softness of the traditional nursery style. Soft pastel colors (often including pink or blue) usually with plenty of white. As mentioned above, sage and lilac shades are popular as are caramels and creams. Soft yellows are also making a comeback in nursery design. White traditional furniture with soft curved lines is usually included. The Jenny Lind style is also a popular option. Old fashioned furniture pieces such as nursery rocking chairs and children's toy boxes also make an appearance. The floors are usually covered in soft carpets, although hard wood floors are also common especially in baby nurseries that are part of older houses. Lovely soft rugs soften the effect of the warm wood. Common traditional nursery wall treatments include wall paper, stenciling, chair rails and wall paper borders. Fabrics are cotton with understated patterns such as gingham, paisley, floral or damask. Handmade baby quilts are also a traditional element of this nursery decorating style. Baby room decorating accessories that you would expect to find in a traditional nursery include teddy bears, family photos, mementos and keepsakes, as well as, handmade wall decor, blankets and crib bedding. The traditional nursery style creates a soft, comforting loving ambience for your little one to nestle into. 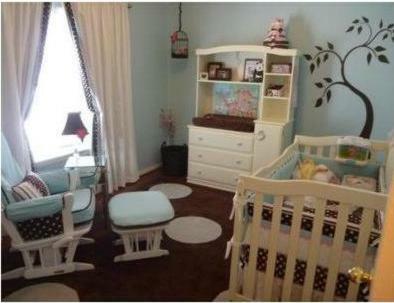 Don't forget to check out the baby rooms gallery for more baby room decorating inspiration and ideas.